experienced nowadays, if ever. Is this another long forgotten relic from Mansion history? Or is it my imagination, hmm? Here's a little experiment you can do with (1) a blindfold, (2) a chair or stool that spins freely and smoothly, and (3) your best friend Bob. Blindfold Bob well, and ask him to report his movements as he perceives them. Make sure you aren't too close to a wall or anything else that would give the ear telltale clues about the revolutions of the chair. Spin him to the left with a single push. He'll tell you he's turning to the left. Let the chair slow down on its own. If it's a good, free spinner (that is, it spins a long time when you push it), Bob will probably tell you he's come to a halt before he has stopped spinning. Now reach over and stop the chair before it has stopped on its own. Bob will tell you he is now turning to the right. He's sitting perfectly still right in front of you, convinced that he is spinning slowly to the right. He won't be dizzy either. Have him remove the blindfold. Now he's dizzy. 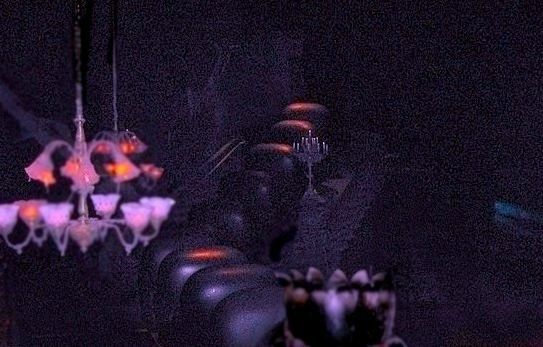 The very first time I rode the Haunted Mansion (August 14, 1969), the Limbo area was very dark indeed. By the time I got to the top of the stairs it was pitch black, and I had no idea what was coming next. When the little bump and wobble occurred, I picked up a sensation of spinning but wasn't 100% sure about it. All I know is that at that moment I could not tell if I was moving or stationary, spinning or not spinning. "Now what happens?" I remember it well, because that was the first and only time I was ever genuinely frightened on the ride. 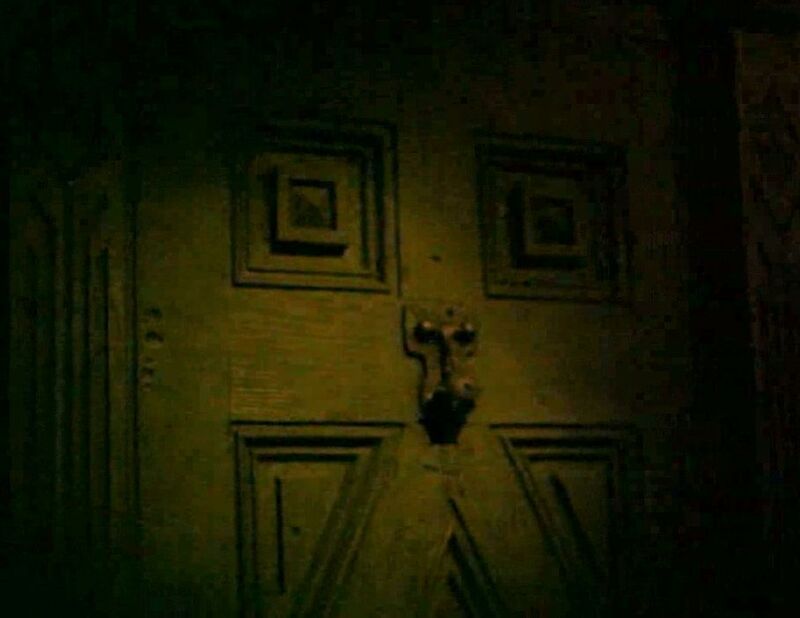 When the doorway of the first room began showing its pale rectangular opening in the darkness, I was your woozy friend Bob for a few long seconds. Like I said, I'm not certain, but I suspect that the wobble was put there for the purpose of disorienting the rider in the darkness. It might still work if (1) it's your maiden voyage and if (2) your eyes are still sufficiently unused to the dark by that point. I can't tell, because once you know what the doombuggy does, the effect is gone forever, and if even the tiniest, dimmest light is visible (and that's usually the case), the effect will not work even the first time. If any of you Forgottenistas have ever experienced this effect, I'd be interested in hearing about it. the power to choose. This is another long forgotten chapter from the tale that is "your journey through a haunted house." other hallway and dragged down it backwards, as if a vacuum were pulling you in. At Disneyland and Tokyo, the pseudo-choice between the two halls is made from a room with yellow wallpaper that is discontinuous with the wallpaper in either hall, the red and black stripes of the EH or the demon-mask damask of the Conservatory and COD. In other words, neither hall presents itself as the obvious continuation of the room you are in. This is also true architecturally, thanks to the irregular shape of the room. Note that we've got the three primary colors at work here. " So what? " you ask. Beats me, but note that we've got the three primary colors at work here. as a departure branching away from the periwinkle path. 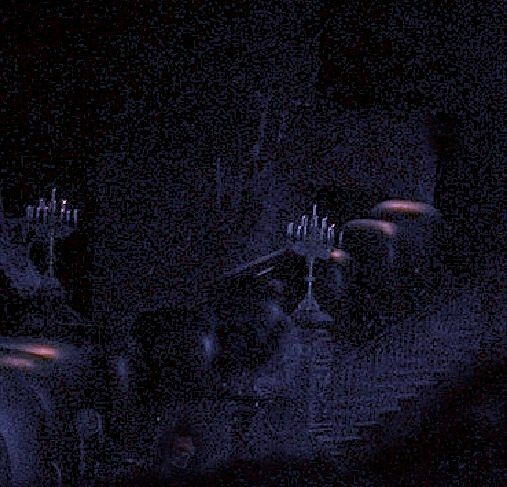 Phantom Manor has always been that way. ". 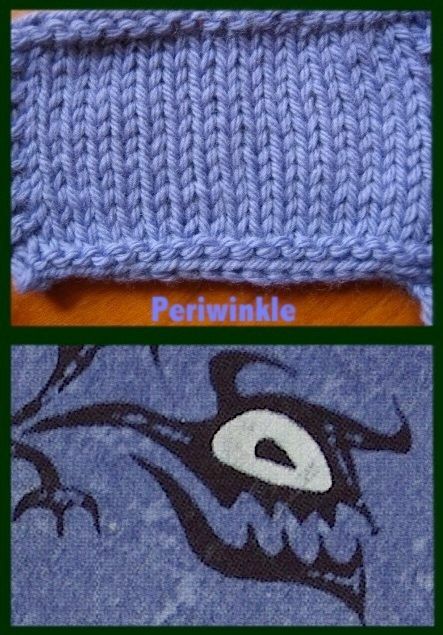 . . putting the wink in periwinkle since 1969." (or unattractive) options was seriously compromised before the Mansion even opened. drapery. Have you ever noticed how alike they are? No? And you call yourself a Mansionologist! You make me ashamed. on each side with identical doors, and the same design is used in both halls. The halls are both "endless" too. The EH is almost literally so, by dark ride standards anyway. Believe it or not, it's the same length as the Grand Ballroom, and there are 12 doors, six on each side, before you get to the mirror that multiplies them still further. As for the Corridor of Doors proper (that is the official name), it has a limitless and otherworldly feel to it, and this, my friends, is imagineering magic at its finest. Magic I say, and I'm feeling inspired. Even as I write, I can feel the left brain fading and the right brain taking over. Feebly I resist, but all for naught. The Corridor of Doors! Ah, the beloved COD! Let us cast a hopeful spell, a charm against destructive Imagimeddling. "Within this hallowed hallway, where normally noisome noises annoy not, may every entrance ever entrance. May the present perfection of every way out outweigh every impulse to improvise. Leave it alone, damn it." tell you this: when someone says that it's their favorite part, I know I am going to like that person. The COD may evoke a sense of endlessness, but how many doors are there, really? If you don't already know the answer, take a guess right now. Yes, now. Before you move on. 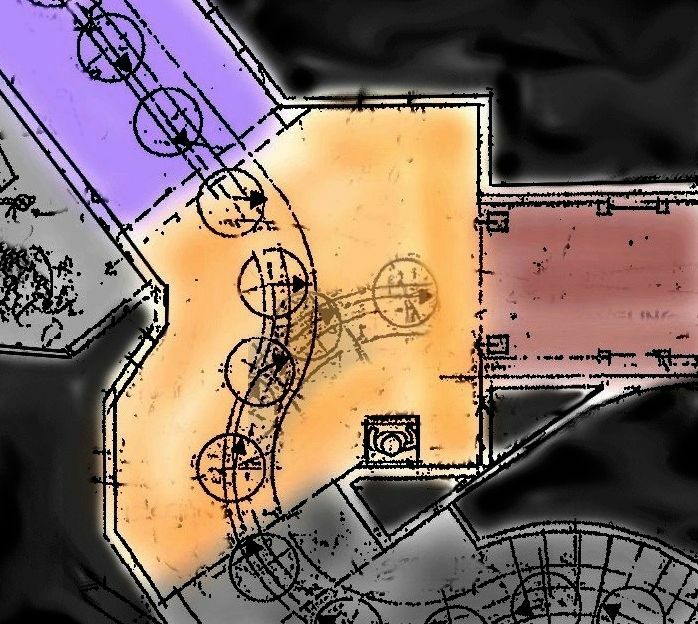 You'll need to decide if you want to include the Conservatory as part of the COD. If you do, that'll add one more door to the DL tally, and two more to the WDW/Tokyo (remember the Missing Door?). Those are the doors on the wall opposite the coffin. dee dee dum . . . Done yet? Don't overthink this; just take a guess. Oh come on. Okay, look, I didn't mean that thing about being ashamed. Without the Conservatory, there are only two doors on one side and four on the other before you reach the Clock Hall, and one of those is an emergency exit. You thought there were more than six, didn't you? I suppose it's possible that some among you who honestly did not know the answer to begin with may have guessed correctly. Some. But I'd be willing to bet that none of you underguessed and most of you overguessed. Thanks to crazy angles and clever twisting and turning, the COD seems longer than it is, and the doors seem more numerous than they are. With inspired architectural imagineering like that, who needs a mirror? Don't get all excited about the "wild wall." That just means, "removable wall." 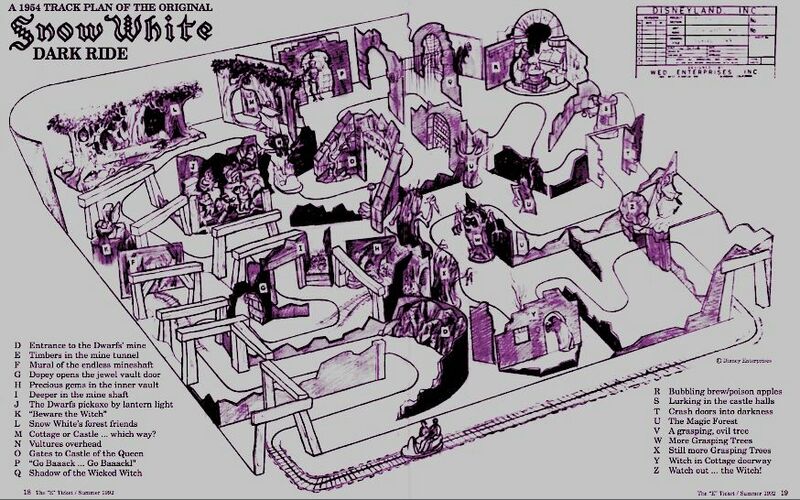 How exactly is this pseudo-labyrinthian illusion accomplished? And don't say "imagineering magic." We are men of science. The artsy-fartsy right side has had its fun; now show the left brain some respect. You have a presumption of rectangularity born of lifelong experience with buildings that you bring with you into any room. 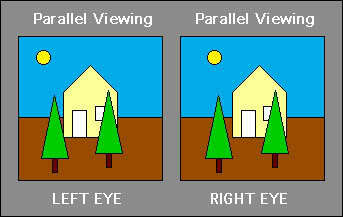 You expect right angles at the corners and opposing walls to be parallel with each other. Stop looking at that animated gif. I'm talking to you. This presumption makes it quick and easy for your subconscious to give you a nice feel for the size of the room you enter. But if you are going down a hallway backwards, and the walls are set at crazy angles, and even the width of the hallway varies unpredictably (something easily overlooked—see the blueprint), your poor little subconscious never gets the data it needs in order to comfort you with even a rough sense of the limits of your environment. Ordinarily that job is done in an instant. I don't know this for sure, but what I suspect is that the frustration of this automatic process translates into an exaggerated sense of the length of the hallway. Perhaps this is because experience has shown that when it takes your subconscious an overly long time to give you a report, it's often because the place is huge. Okay, now you can look all you want. 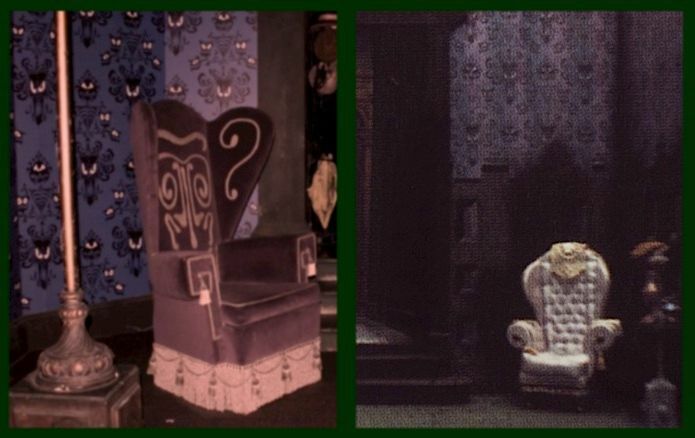 dark rides (Snow White, Peter Pan, Mr. Toad) were smushed into surprisingly small rooms, and yet you scarcely notice it. advantage of your long-trained subconscious expectations about normal architecture. It really isn't fair. First, you experience a hitherto unknown feeling of being taken against your will, or at least without regard for your will. No one would walk down an unfamiliar path backwards. You are being dragged by some force, a "perpetual levitation" presumably supplied by the Ghost Host. Earlier, your doombuggy's ascent of the staircase and entry into the yellow room merely mimicked what would be your own perspective and pace if you were walking voluntarily. At WDW and Tokyo, this leisurely stroll also includes the portrait hall, library, and music rooms. But an alien force took you over as you were faced with the choice of two hallways, and before you could choose, it sucked you into one of them and is now pulling you along. The "choice" was a mockery, you see. 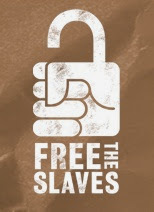 Its purpose was to demonstrate to you that your decisions no longer matter at this point: You are captive. A sense of absolute helplessness sets in for the first time, horrible and sickening, and how cool is that? 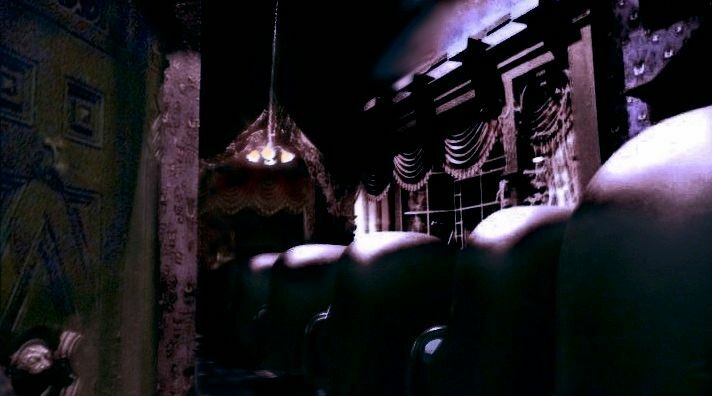 Second, by going backwards you notice the animated doors and hear the sounds coming from them as you pass them, which leaves open the possibility that it is you who are getting the ghosts so riled up. If all this commotion were in front of you as you moved along, you would see that they were already upset before you got there. You would know that it wasn't something you triggered and that therefore they aren't specifically mad at you. And that wouldn't be nearly as scary, would it? These guys are good. slipped into the realm of the long forgotten. Just when we think there can't possibly be any more, there are possibly more. That's all for now. Please step out to your left. 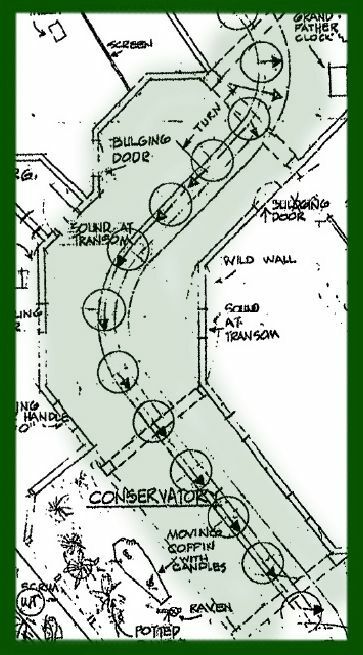 history about the Corridor of Doors and featuring some delightful artwork never before seen.